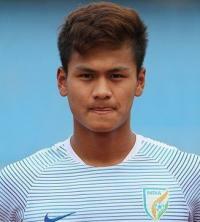 Manipur is an Indian state located at the northeastern part of India. 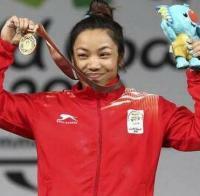 The capital of Manipur is Imphal. The people of this state speak Manipuri language. Before 2011, Protected Areas Permit was required to enter the region but this law was changed from 1st January 2011 and the foreigners are allowed to go there without any restrictions. Manipur came under the influence of British rule in 1891 and was a princely state till the independence of India. 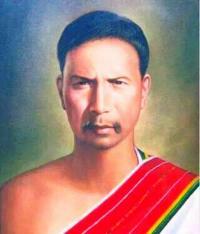 The king of Manipur did not want to join the Indian union and India had to force him to accept the supremacy. The treaty was signed on 21st September 1949 and Manipur was formally annexed on 15th October 1949. During the Second World War, it had to face many battle scenes. According to the Manipur Constitution Act of 1947, democratic government was formed with the king as its head. Maharaja Budhachandra was the king at that time. Manipur was made as a Union Territory in 1956 and it gained the status of state in 1972. The first chief minister of the state was Muhammad Alimuddin. 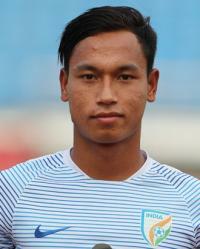 Manipur has Mizoram in the south, Nagaland in the north, Assam in the west and Burma in the east. The total area of the state is 22,347 square kilometers. Manipur is rich in water resources as there are four river basins here namely Barak River Basin, Manipur River Basin, Yu River Basin and Lanye River Basin. The important rivers in Manipur are the Barak River, The Manipur River, Imphal River, Iril River, Nambul River, Sekmai River, Chakpi River, Thoubal River and Khuga River. There are four types of forests in Manipur occupying an area of 14,465 square kilometers namely tropical semi-evergreen forest, dry temperate forest, sub-tropical pine forest and tropical moist deciduous forest. These forests produce the trees like teak, pine, oak, bamboo, cane and other crops like tea, rubber, coffee, orange, rice and cardamom. Manipur is situated 790 meters above sea level and it has a pleasant climate. The maximum temperature in summer is 32 degree Celsius and in winter it drops below zero degree. Sometimes the region has snowfall also. January is the coldest month and July is the warmest. The best time to visit is from October to February. The average annual rainfall is 1467.5 mm. There are 9 districts in Manipur as of June 2012. 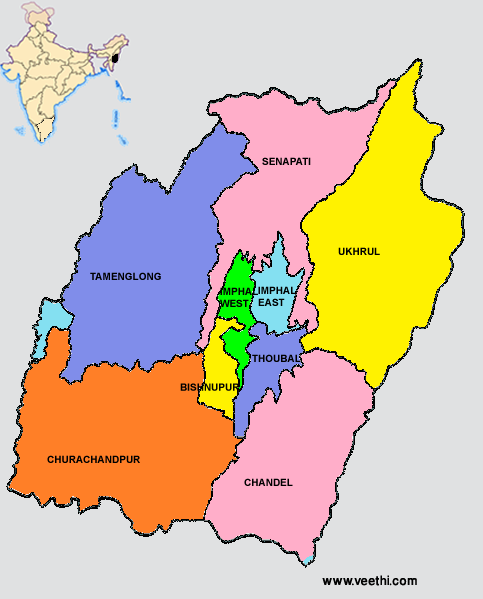 Given below is the Manipur state map with all 9 districts marked. 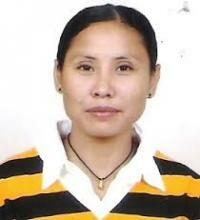 According to the 2011 census, the total population of Manipur is 2,721,756. The tribal people namely Nagas, Kukis, Hmar, Meiteis, Pangal and Bhamons live in Manipur. 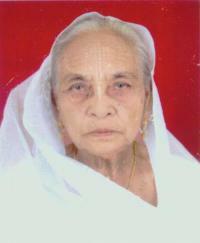 People practice many religions like Sanamahism, Hinduism, Islam and Christianity. The spirit of culture is seen among the people of Manipur. They celebrate Laiharaoba festivals and other cultural symbols are Shumang Lila and Phampak Lila. Some other festivals celebrated here are Ningol Chakouba, Yaoshang, Ramzan ID, Kut, Gang-Ngai, Chumpa, Christmas, Cheiraoba, Kang and Heikru Hitongba. Manipuri dance is the traditional dance of this place which depicts the love story of Lord Krishna and Radha. There are some traditional games played here namely Mukna or wrestling, Mukna Kangjei, Sagol Kangjei or Polo, Yubi Lakpi, the traditional football game, Oolaobi, the outdoor game of girls, Hiyang Tannaba or Boat race, etc. The literacy rate of the state is 79.85% among which the male literacy rate is 82.14% and female literacy rate is 65.46%. The Manipur University was established on 5th June 1980 and this was aimed to disseminate knowledge and wisdom. Many colleges are affiliated to this university. Other educational institutions are Central Agricultural University, National Institute of Technology, Jawaharlal Nehru Institute of Medical Sciences, Manipur Institute of Technology, Regional Institute of Medical Sciences, Central Institute of Plastics Engineering and Technology, Imphal College, Modern College and D. M. College, etc. The economy of Manipur is determined by agriculture, industries, forest products, tourism and handloom. About 76% of the work force are employed in agriculture and related activities. 9.41% of the lands of Manipur are agricultural lands. The main crops are wheat, paddy, maize, ginger, turmeric, sunflower, pineapple, banana, orange, cauliflower, cabbage, carrot and pumpkin. The majority of the women are engaged in handloom and handicraft industries. They manufacture pillow covers, bed sheets, towels and fashion garments. Above ten lakh tons of bamboo is produced every year and more than 1.5 lakh people are engaged in these works. There are about 7,700 small industrial units dealing with cement, pharmaceuticals, plastic and steel. 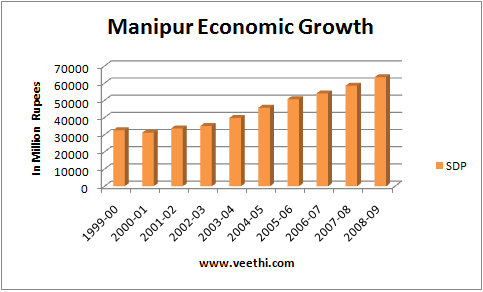 The gross domestic product of Manipur was 3260 crore rupees in 1999-2000 which has nearly doubled to 6344 crore rupees in 2008-2009. This is enough to know about the growth of the state. There is an airport in Imphal, the capital of Manipur and the postal air cargo services operate on all days. The place is connected to other places like Guwahati, Kolkata, Delhi and Bangalore. The flight services like Indian Airlines, Indigo, Jetlite and Kingfisher operate from here. The airport has the facility of accommodating the landing of eight aircrafts at a time. Night landing facility is also available in this airport. Imphal is connected to Dimapur in Nagaland via NH 39 and is connected to Jiribam via NH 53 through train. Jiribam to Tupul railway line is under construction. If this project is completed, Imphal will become very closer to the other parts of India. The three national highways, NH 39, NH 53 and NH 150 cross through the state. There are many places of visit in Manipur. Keibul Lamjao National Park is located 48 kilometers from Imphal and is the abode of endangered species. Asheiningthou Garden is a beautiful garden located near Mantripukhri. Other places worth visiting are War Cemeteries, Manipur Zoological Gardens, Moirang, Loktak Lake and Sendra Island, Kaina, Ukhrul, Tengnoupal, Manipur State Museum, Maibam Lotpa Ching, Sadu Waterfall, etc.